The European Burmese stands out from the Burmese by way of its additional colors and breed type. Burmese come in brown, chocolate, blue and lilac. European Burmese come in those colors as well as red, cream, brown tortoiseshell, chocolate tortoiseshell, blue tortoiseshell and lilac tortoiseshell. The body type also differs. The European Burmese has a moderate body with gently rounded contours, but it’s muscular and heavier than it looks. Expressive eyes curve slightly at the top, slanting toward the nose, and range in color from yellow to amber. The wide cheekbones taper to a short, blunt wedge. It’s described as elegant but not fragile. The Foreign Burmese and the Burmese are alike in their sweet disposition, intelligence and affection for people. They can be chatty, not surprising given their Siamese heritage. Foreign Burmese enjoy the company of other animals, but they don’t mind being an only pet as long as they get plenty of attention. This is not a cat that’s satisfied to be left alone for long periods. Lively and quick to learn, they enjoy playing and are easily trainable. The European Burmese is generally healthy, although some may have dental problems such as tartar buildup and periodontal disease. The short coat needs weekly brushing to keep it shiny, and the cat enjoys the attention. The European Burmese generally weighs 7 to 14 pounds. Females are smaller than males. The European Burmese, sometimes known as the foreign Burmese, was developed in the 1960s by British breeders who imported Burmese cats to England and then crossed them with red-point Siamese and British Shorthairs in an attempt to expand the gene pool. By introducing the gene for red, they expanded the number of coat colors in the breed. 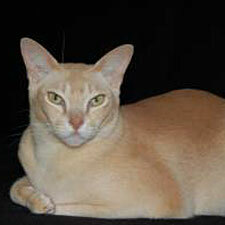 The European Burmese was recognized by the Cat Fanciers Association (CFA) in 1994. Now, it’s also recognized by the Canadian Cat Association (CCA), Cat Fanciers Federation (CFF), Traditional Cat Association (TCA) and United Feline Organization (UFO). The CCA and CFF register it as the Foreign Burmese.